In the Calendar of Common Worship, the Feast of the Visitation or the Visit of the Blessed Virgin Mary to Elizabeth may be celebrated in the Church of England on 2 July, the date it was once assigned in The Book of Common Prayer, instead of 31 May, the date when it is usually celebrated in both the Church of England and the Church of Ireland. 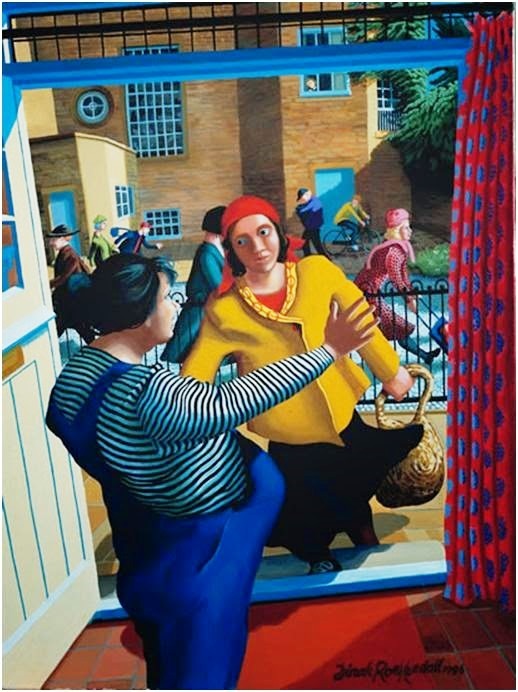 One of my favourite depictions of the Visitation is Dinah Roe Kendall’s painting, Mary meets Elizabeth (1996), which is in acrylic on canvas. Dinah Roe Kendall was born in Bakewell, Derbyshire, in 1923 into a family of professional artists. Her grandfather and great-grandfather were both well-known artists. Her great-grandmother was the daughter of the Victorian sculptor whose statue of Lord Nelson stands in Trafalgar Square, London. Her father planned for her to proceed to full-time training, but World War II and his early death occurred before these hopes could be realised. After her wartime nursing, she attended Sheffield Art School and was then received an ex-service grant to enable her to study at the Slade School of Fine Art in London (1948 to 1952). There Lucien Freud asked her to sit for him, Stanley Spencer’s daughter Unity was a fellow-student, and Dinah learned from Jacob Epstein, Stanley Spencer and many other artists. The nostalgic world of primitive painting is far removed from her vibrant Biblical scenes, placed in modern contexts and painted in modern materials. Although the influence of her teachers can be seen in her work, she has moved on from them, developing a style that is distinctly her own. Her paintings are drenched in colour, reflecting five years of living in Cyprus and the influence of modern artists she has admired, including Peter Howson and Ana Maria Pacheco. She usually paints in acrylic on board or canvas, mixing the paint with thickening media. Her angels wear robes built up of thick knife and brush strokes flecked with gold. She paints the cross as a visual sermon: no mere philosophical concept, but a hunk of wood along which, as Francis Schaeffer used to remark, one could have run a finger and got a splinter. Despite changing fashions and much pressure to explore abstract art, she has always remained a figurative painter. Her Biblical scenes are cast in modern contexts: Christ visits a school in Sheffield; Lazarus is raised from the dead in an alcove in a wall borrowed from Chatsworth House; Jairus’s daughter wakes up upstairs in a modern home, surrounded by modern neighbours as an abandoned teddy-bear on a chair in by the window watches on in amazement; the infant Christ presented in the Temple is looking right at the viewer; in the case of the Woman taken in Adultery, Christ’s finger writing in the dust points out of the canvas and at the viewer. Her ‘Entry into Jerusalem’ is set in the playground of the Porter Croft School in Sheffield, where the painting now hangs, and the Baptism of Christ takes place in a swimming pool. At the ‘Supper at Emmaus,’ Christ sits at the head of a table, with two disciples whose hands reach out towards his. He is holding a loaf of bread; wine and glasses stand ready. His pose recalls Stanley Spencer’s 1939 painting of a lonely Christ in the Wilderness, cradling in his hands a scorpion. There is social comment and humour too in her work: the Good Samaritan is a black man; ‘The Marriage at Cana in Galilee’ is a witty footnote to a famous painting by Breughel; and ‘Jesus visits Bethany’ is a delightful depiction of an off-duty Christ, even though the crowds are pressing in at the door. Inside the house in Bethany, Lazarus sits apart from the others in a curtained alcove as if the shadow of the tomb has not quite left him. His eyes are fixed not upon Christ but upon some faraway place, as if contemplating a landscape that only he has seen. At the opening of an exhibition of her paintings in Winchester Cathedral some years ago, Dinah Roe Kendall said that she wants to show that meeting Christ is an unsettling and life-changing experience that could happen at any point in time. ὅτι ἐποίησέν μοι μεγάλα ὁ δυνατός. Zephaniah 3: 14-18; Psalm 113; Romans 12: 9-16; Luke 1: 39-39 (50-56).